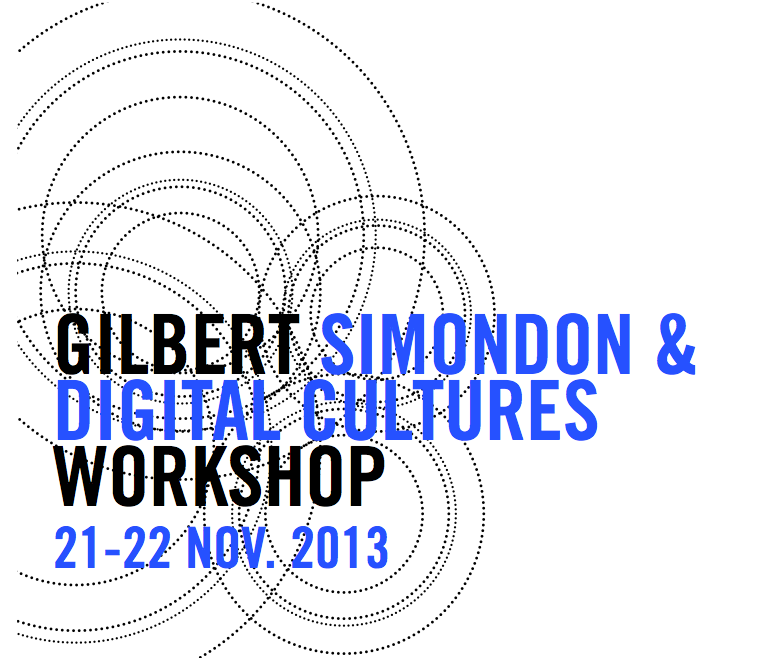 This workshop is dedicated to Gilbert Simondon: our contemporary. It will explore and delineate the significance of his work for the analysis of our contemporary techno-medial condition. Therefore it focuses on the question of the digital, and aims to put forward a critical agenda for research into digital cultures, informed by Simondon’s thought. In Du Mode d’Existence des Objets Techniques(1958), Simondon showed us a new approach to the understanding of ‘technical objects’, and rethought the relation between humans and machines, cultures and technologies. Today we are witnessing the proliferation of types of object – digital objects in particular – while the very notions of object and objectivity are being transformed by digitizing processes. This has inevitable implications for experiences and concepts of subjectivity, and Simondon’s work on individuation – in particular in L’individuation: à la lumière des notions de forme et d’information (2005) – remains one of the most original and complete, yet one of the most neglected, explorations of this topic in the history of Western philosophy. This work remains particularly invaluable for its compatibility with his work on technical systems and technological culture. What do terms such as ‘object’ and ‘subject’ mean today? If they are undergoing a displacement in the era of digital cultures, then this issue was perhaps most obviously pre-figured by Felix Guattari’s anticipation of a ‘post-media’ age when we wrote: “one can hope, from there that operates a revision of power of mass media which crashes the contemporary subjectivity and a new entry toward a post-media age consisting of an individual-collective re-appropriation and an interactive usage of machines of information, communication, intelligence, art and of culture”. While the adventures of post-humanism and cyber-feminism have explored this territory for several decades already, we contend that Simondon’s work – like Guattari’s – remains a crucially under-exploited resource for understanding the ‘post-media’ age, its consequences for subjectivity, the politics of networks, the nature of digital objects, and the role of imaginations, innovation and participation in the information society (L’invention dans les Techniques, 2005; Imagination et Invention, 2008 ) ( Communication et Information, 2010). While Simondon’s work is known indirectly by readers of Stiegler, Hansen ,and Massumi, very little has been done to develop his ideas for the analysis of contemporary digital culture and its political implications, despite its obvious relevance. We propose this workshop as a first step towards rectifying this situation. This entry was posted in Events by Nicholas. Bookmark the permalink.